Home > Large Format > Should You Use Large Format Documents Archiving Services? Should You Use Large Format Documents Archiving Services? Does your business or organization seem overwhelmed by oversized documents? 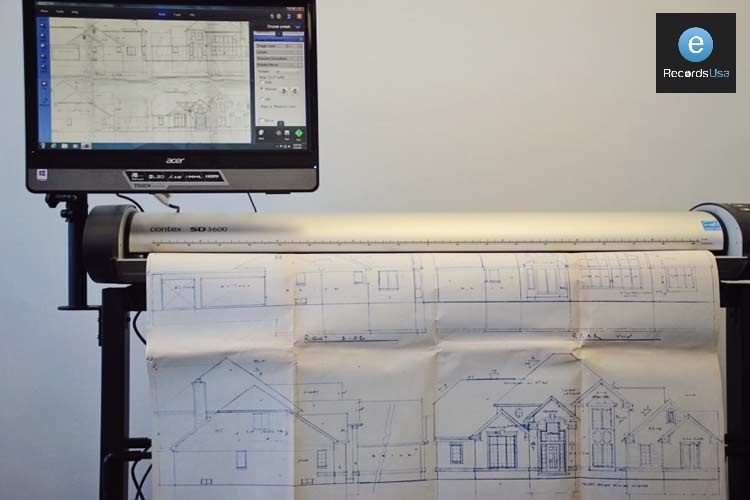 Land surveyors, engineering companies, architectural services and a long list of other entities often find themselves managing an ever-increasing number of large documents. What if you could eliminate most of that paper, using only the hard copies when absolutely essential? With large format documents archiving service it is easier than ever. At eRecordsUSA, you can find an enormous list of scanning and digitization services. Not only can you get any hard copies converted into digital copies via their premium scanning services, but you can turn to them for large format documents archiving though their online storage solutions. Imagine having a professional team come and pick up the many large format documents you have to store and manage, scan them to the highest resolutions and qualities possible, return them, if you wish (or destroy them if you don’t want hard copies back), and then put your entire library of digitized item into an easy to use cloud storage solution. They would work with you to ensure everything is organized as you need it to be and in the appropriate file types. They then walk you through the use of the materials – whether your base is yourself and your team or a much broader public or company group. Doing this means you can be as paperless as possible and yet still easily and readily access any number of large format documents. Do you need them to be searchable and readable (such as documents with OCR used during scanning)? That is possible. If you need graphics to be razor sharp, too, the large format documents archiving service from eRecordsUSA delivers such results. If you are ready to escape a sea of oversized documents or simply free up office space by digitizing your entire array of documents, this is a very savvy answer to the issue. eRecordsUSA is also specialized in providing Document Scanning Services, Document Imaging Services, Large Format Document Scanning Solutions, Large Format Scanning Services, Large Format Document Scanning Services, Large Format Blueprint Scanning Services, Large Format Document Digitizing Services and more. Would you like to receive a free quote for Large Format Documents Archiving Services? Call +1.855.722.6669 or eMail us at info@eRecordsUSA.com.